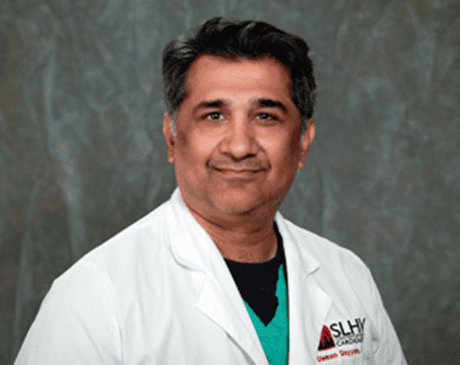 Usman Qayyum, MD, FACC, of St. Louis Heart and Vascular with six office locations serving St. Louis and the surrounding communities, has been practicing cardiology for more than 25 years. He’s affiliated with numerous local hospitals, including Christian Hospital and SSM Health DePaul Hospital, and is licensed in both Illinois and Missouri. Dr. Qayyum is board-certified in internal medicine, cardiology, and interventional cardiology, and is a Fellow of the American College of Cardiology. He received his medical degree from Allama Iqbal Medical College in Lahore, Pakistan. He completed his residency at Wayne State University School of Medicine in Detroit, and two fellowships at Loyola University in Chicago. Dr. Qayyum's special interests and areas of expertise include peripheral vascular disease, which is also called peripheral artery disease, and venous disease, including ulcers. His diagnostic and treatment specialties include coronary angioplasty and angiograms, rotablation, and echocardiograms, including transthoracic echocardiograms and 2D echocardiograms.